Although it’s been around for a while, we’ve been hearing more and more about Squarespace lately. While it could be a great option for a portfolio or personal website, the real question is: can you use Squarespace for a law firm website? 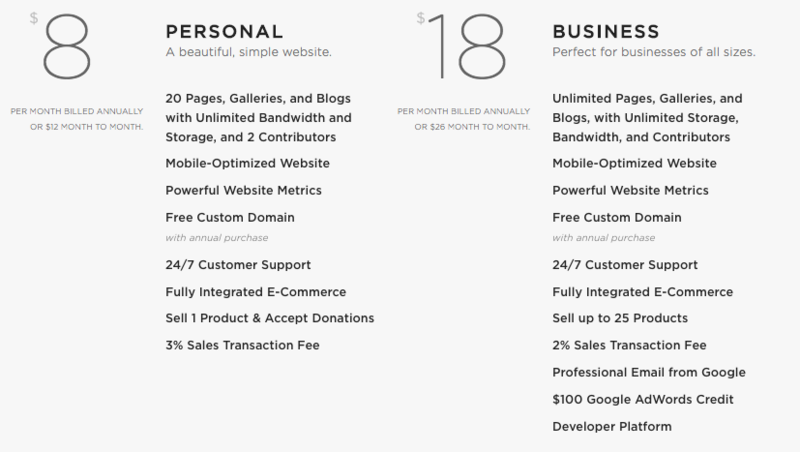 Low cost – Squarespace websites run between $8 and $18 a month. For comparisons sake, using WordPress and hosting on WPEngine (which we recommend), runs $29/month. Although that extra $10 provides daily automatic backups and increased security measures, it’s still more expensive. Ease of use – For some one with minimal tech experience, Squarespace is very user-friendly. It’s designed well and uses a drag and drop page builder, which allows you to see your changes in real time. WordPress, while still fairly intuitive, comes with a lot more bells and whistles. Mobile responsive – While it’s not uncommon for site builders to be mobile friendly, it’s important. All Squarespace sites work on computer monitors, phones, and all devices in between. WordPress is also mobile friendly, but it’s theme/developer depenedent. Lack of customizability – Squarespace pales in comparison to WordPress in terms of customizability, in both functionality and design. Do you need a multilingual site? Want randomized blog posts in your footer? Have a vision in mind of exactly how you want your site to look? Squarespace won’t work for you. SEO limitations – Squarespace makes SEO basics possible, but certainly not easy. Titles and meta descriptions indicated as “optional.” URL redirects, absolutely vital if you ever do any site restructuring, are hidden in Advanced settings. In WordPress, using a plugin like SEO Yoast makes SEO basics easy. Proprietary – Unlike WordPress, which is open source, Squarespace is a proprietary system. While this might not cause problems short-term, it could mean trouble down the road. For example, only Squarespace developers can create tools for their websites or help you if something goes wrong. Image focused – While for some this may be a plus (think wedding photographers and chefs), this can be a limitation for the legal industry. Many law firms lack high quality images that represent their firm. Should You Use Squarespace for Your Law Firm Website? My final verdict? Squarespace isn’t a bad option, especially if you’re on a shoestring budget and have a couple free hours on a Tuesday night to build it yourself. You could do worse. But you could also do much, much better. Assuming time and money negligible, a custom WordPress site will always be your best bet. It will allow you to do everything you want to do and differentiate you from your competitors. For more information, you can read up on our website build process here. If a custom WordPress site isn’t in the cards for you this year, you may be a good fit for Echo. Echo is our alternative to Squarespace and other website builders. It’s a legal-specific templated site that gives you the SEO benefits of a custom WordPress site and the low cost simplicity of Squarespace. If you want to learn more about Echo, you can do so here. Utilize their 14 day free trial without changing anything on your current site to see how it works for you. Make sure you no index your site during this time so it can’t be found by search engines. Purchase a new domain or link your existing firm domain (use lawfirm.com vs lawfirm.squarespace.com). Have more questions? Need advice? Give us a call. Its a very nice and knowledgeable article you have posted. Websites are usually designed on Squarespace and that looks very attractive and efficient. I think you article will help all those people who worked in the field of law . Even I am lawyer, and I got my designed on squarespace platform. and I would thanks to you for sharing such article. I am looking forward for your more articles.